All four Group Picnic Areas offer tables and barbecues and Area A also offers electricity and a covered shelter. Areas accommodate from 150 - 400 people and are available from 10 am to sunset. Group Picnic Reservations are not required, but are recommended, and must be made by phone through the Parks Office. Nestled within native laurel and pine trees, above the beautiful Applegate River, our 30-site Campground provides an ideal camping location while attending the Britt Festivals in nearby Jacksonville. 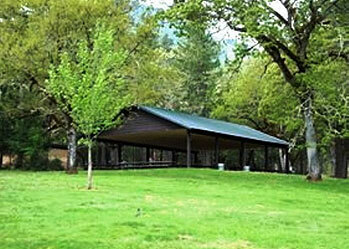 All sites include a campfire ring and picnic table and restroom/shower building is nearby. Individual campsites are always first come, first served, no reservations are accepted. Need more space? 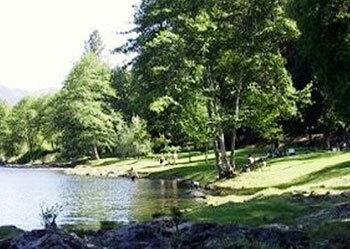 Be sure to utilize the Group Campground, which accommodates up to 100. Reservations are required for the Group Campground and made through the Parks Office. Did you know that Jackson County Parks, in cooperation with A Greater Applegate and the Pacific Power Blue Sky program recently constructed a solar panel array the park that will generate a significant amount of the Park’s electricity? The Pacific Power Blue Sky grant program provided $89,530 to install the panel that generates approximately 24.5 kWp. The array looks beautiful in the park, serving as a shade structure for visitors looking to get out of the hot summer sun. There are beautiful interpretive displays and education elements surrounding the solar panels for park visitors to learn more about the sustainable elements of the project. You can even view the electrical generation in real-time!